Need a nightmare? Behold, Peter Capaldi's first Doctor Who figure! Our very first rendition of the Twelfth Doctor in plastic has been unveiled at Toy Fair London - alongside a new wave of Doctor Who action figures featuring Daleks, a weeping angel, a Baked potato roughly in the shape of a Zygon, a poorly photoshopped version of the Series 5/6-era Matt Smith, and a young Pat Butcher. The Twelfth Doctor, still clad in his post-regenerative outfit of his predecessor's frock coat and waistcoat (heartbreakingly sans-bowtie), comes armed with his sonic screwdriver and... a surprisingly cocked eyebrow? I don't know, it's all rather petrifying to me. 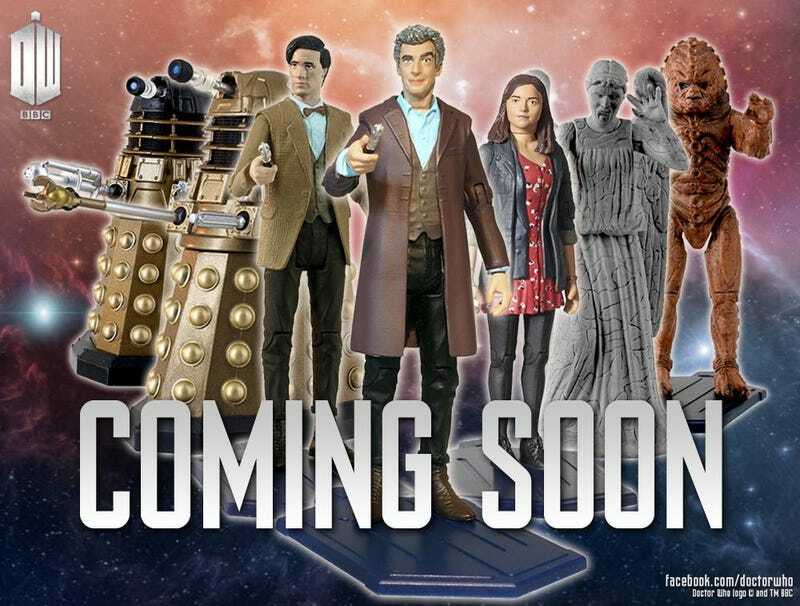 The wave of figures is due for release soon, with a further range featuring The New Doctor in his own outfit due later this year to coincide with the release of Series 8.